Today I went to Brugge (Bruges for those of non-Flemish or non-Dutch persuasion), a city in the Belgian province of West Flanders. It was my first visit, and what I knew about Brugge beforehand wasn't much: it was a medieval city like Gent and (parts of) Antwerp, and it had been a center of power in the late Middle Ages. What I didn't know, for instance, is that the entire city center is on the Unesco World Heritage list, and that it has only relatively recently emerged from a decline that's been going on for hundreds of years. 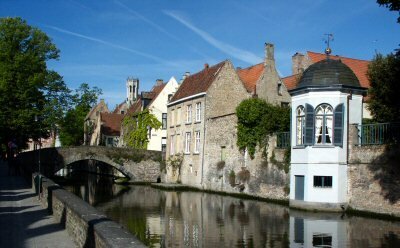 Having seen countless historic cities and buildings since I was a small child, I was prepared, well, not to be underwhelmed, but also definitely not to be overwhelmed by Brugge. The curse of experience is that the more you gain of it, the rarer become the instances when you encounter something that has the ability to surprise and profoundly impress you. Just ask Q. Of course, the upside is that you also learn how to experience something to the fullest, and this goes a long way to offsetting the lost sense of discovery. On occasion, tough, even a hard bitten explorer like myself can still be awestruck by a place. Today was one such occasion, for Brugge exceeded all my expectations. It is a magical place. When you walk its cobbled streets you cannot be but enchanted by your surroundings. Tall houses with stepped facades alternate with gothic palaces, the spires of their corner towers accenting their architectural grandeur. Arched bridges span canals lined with brick houses, their window sills overhanging the water like washerwomen exchanging the latest gossip. There are quiet lanes and busy squares, and alleys leading to romantic courtyards. One might be tempted to use terrible cliches to describe the city, such as that walking its streets takes one back centuries to a time when the printing press was still a recent invention, and noone yet questioned the divine right of kings to rule the land. This would be missing the point entirely, however, for Brugge is a city that is very much alive. People sleep here, work here, eat here. There are markets, strung out along the banks of canals. Shops, selling quality rugs, tapestries, furniture, ornaments, and art. Gastronomy and nightlife. There are lots of people from out of town, but this is no tourist trap. Brugge is genuine. The reason that we decided to visit Brugge in the first place was the exhibition about Charles the Bold at the Groeninge Museum. 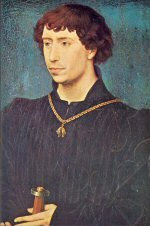 Now, Charles the Bold, so nicknamed for particular prowess on the battlefield in his younger years, was the last Duke of Burgundy, a state within the French state incorporating most of present day Belgium and the Netherlands, as well as large swathes of France. Charles had big plans: he wanted to become independent from the French Crown, and he wanted to create a German-Burgundian empire, with himself at its head, of course. It all came to naught when he died in 1477 fighting, of all people, the Swiss, leaving his nineteen year old daughter Mary as his sole heir. She had a grandson also called Charles who became the Holy Roman Emperor, thus finally accomplishing what his great grandfather and namesake Charles the Bold had originally envisioned: a pan-European empire consisting of most of the original Duchy of Burgundy and what is today Germany. Of particular interest to Dutch people is the career of emperor Charles' son Philip: he became king Philip II of Spain and tried to subdue the unruly Dutch people. This led to a war known as the Dutch Revolt, and the eventual creation of the independent Dutch Republic. This chain of events was triggered by Charles the Bold's unhappy encounter with the Swiss at Nancy all those years ago: if he hadn't been killed there, Burgundy might have survived as a semi-independent state, and the Lower Countries might never have become property of the king of Spain, and therefore the Dutch Revolt might never have happened. So, one could say that if the Swiss hadn't sent Duke Charles on to greener pastures, the Dutch might never have won their independence. But they did, bless 'em! It's probably the reason we give them our money to safekeep. Charles the Bold holds a special interest to me personally as well, because of his close links to the House of York, England's ruling dynasty from 1461 to 1485. The House of York was a branch of the House of Plantagenet, whose lives and times are among my favourite historical subjects. Charles' third wife was Margaret of York, a sister of Edward IV, the Yorkist king of England. When the latter had to flee England after his erstwhile ally Warwick the Kingmaker had turned against him, Charles gave him refuge in Brugge, and eventually aided him in regaining his throne. None of this was explicitly mentioned in the exhibition, but I did find tangible evidence of this bond between Charles and Edward. A dear friend of mine recently said that I should be seeing, not looking. Well, today I did. High above the tombs of Charles and his daughter Mary in the Onthaalkerk Onze-Lieve-Vrouw church were hanging a row of shields depicting the arms of members of Charles' chivalric Order of the Golden Fleece. Among them I spotted a shield with the familiar arms of the Plantagenet kings. After some examination I managed to decipher the text written on the shield as saying "Edouart, Roi d'Angletèr Et Seigneur d'Irlande". That could only have referred to Edward IV. I felt good about discovering that! I drove home from Brugge fully intending to return soon. Not only is there much yet to discover, but it is also just a fantastic place to be. Brugge, ge hebt m'n hart gestolen! I agree Brugge is a beautiful city (I've actually visited the prison there :-))! I liked the way you described the atmosphere! Hope you'll write more soon!